2019 lake sturgeon season on Black Lake to begin Feb. 2 at 8 a.m. The Department of Natural Resources has announced the 2019 lake sturgeon fishing season on Black Lake (Cheboygan County) will begin at 8:00 a.m. on Saturday, Feb. 2. All anglers must register to participate in the lake sturgeon season. If five fish have been harvested at the end of any fishing day. Fishing hours are 8:00 a.m. to 2:00 p.m. each day of the season. The season will either end at 2 p.m. on Wednesday, Feb. 6, or when one of the above scenarios is met, at which point anglers will be notified on the ice by DNR personnel that they must immediately stop fishing for lake sturgeon. Anglers 17 years of age or older must possess a valid Michigan fishing license. Sturgeon harvest tags, which were required in the past, are no longer available or needed by anglers. The 2019 angler registration process will be similar towhat was enacted in the last few years. Anglers need to only register once for the entire season. An early registration will be held at the DNR Onaway Field Station from 2 to 7 p.m. on Friday, Feb. 1. This station is located approximately five miles north of Onaway on Route 211. Anglers can pick up their fishing identification flags at this time and learn more about season logistics and sturgeon populations from the DNR. Anglers unable to participate in the Friday registration may register Saturday February 2 at the registration trailer at Zolner Road ending on Black Lake. Morning registration begins at 7 a.m. each day of the season. Anglers are highly encouraged to register on Friday, February 1. Anglers will be issued a disposable flag at registration that must be displayed at the entrance of the angler’s shanty each day. 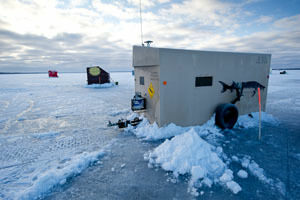 Anglers that harvest a lake sturgeon must contact an on-ice DNR employee and register the fish at the Zolner Road trailer registration site on Black Lake. Registration may include an examination of internal organs and removal of a piece of fin tissue for DNA analysis and aging. Registration logistics were developed in the last decade to allow greater participation by anglers while protecting the population of lake sturgeon in Black Lake from overharvest. In addition, DNR and MSU have been determining annual population estimates of adult fish from the spring spawning run with the assistance of Sturgeon for Tomorrow, which allows officials to set a safe harvest level in cooperation with tribal agencies. Rehabilitation of lake sturgeon in the Cheboygan River watershed is a cooperative effort involving the DNR, the Black Lake Chapter of Sturgeon for Tomorrow, Michigan State University, various tribal agencies, and Tower-Kleber Limited Partnership. For more details, anglers may call the Gaylord Customer Service Center at 989-732-3541 or visit Michigan.gov/fishing. The Black Lake lake sturgeon management plan can be found at www.michigan.gov/documents/dnr/ManagmentPlan-LakeSturgeon-FINAL_543754_7.pdf.